Fabulous sought-after location on quiet, secluded North Lido Key. 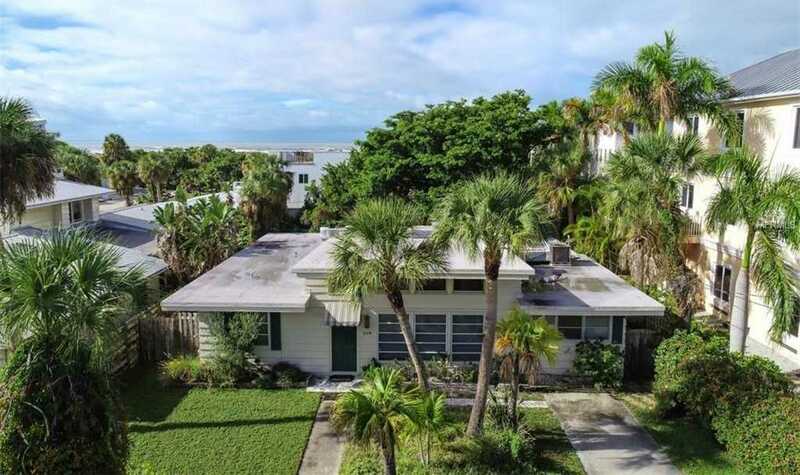 This open-floorplan 4-bedroom 3-bath vintage mid-century home is only steps to the white sands of Lido Beach, St. Armand’s Circle and secluded North Lido Park. You will love the exposed high beamed ceilings with clerestory windows, terrazzo floors, durable cypress exterior, two master suites, and the floor-to-ceiling white brick fireplace. For those who love the old Florida classic style, there is lots of potential. Remodel and have the perfect beach house or build your dream home with a possible view of the Gulf from a second or third story. Sold at land value, the existing home is a bonus. Possible room for a pool, has some deferred maintenance. Many multi-million dollar custom homes are being built in this area by premier homebuilders. The walkability of this property is priceless, a very short stroll to the beach and world-renowned St. Armand’s Circle with gourmet dining, fun boutiques, shopping and galleries. Just minutes to downtown Sarasota’s cultural center. Don’t miss this unique opportunity! Please, send me more information on this property: MLS# A4419574 – $977,000 – 219 N Polk Dr, Sarasota, FL 34236. I would like to schedule a showing appointment for this property: MLS# A4419574 – $977,000 – 219 N Polk Dr, Sarasota, FL 34236.